VisionFund Mongolia (VFM) was founded in 2004 and is part of an international network, called VisionFund International. VFM focuses mainly on impoverished families and communities in and around the capital Ulaanbaatar. 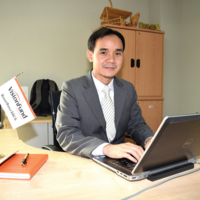 Savoeung Chann obtained his university degree in France and has been the CEO of VFM since 2014. Before his CEO position at VisionFund Mongolia, he worked as Chief Financial Officer at VisionFund Cambodia. Savoeung is experienced both in the NGO and in the corporate sector.